Natrunsfar: Nat's Runbit # 19 - It's all about Huckleberry! Nat's Runbit # 19 - It's all about Huckleberry! Happy Saturday Runner friends! Happy long weekend!! I haven't posted a Runbit in a while, but this is one I am so excited about. As runners we love to EAT and there is nothing better than cooking something delicious that you can have waiting for you when you arrive from a long run. If you ever come to Santa Monica, send me a note. 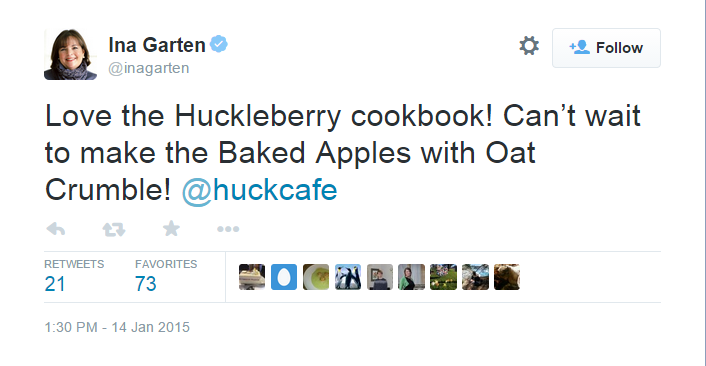 I would be more than happy to meet you at one of my favorite neighborhood restaurants - Huckleberry. WONDERFUL, fresh, healthy, organic food - such a great place to go for breakfast, weekend brunch (after a long run), or an early dinner. Zoe Nathan has come out with this amazing cookbook (along with her husband Josh Loeb - who co-owns Huckleberry with her - and contributors Matt Armendariz and Laurel Almerinda) so even if you can't make it in person, you can try some of her (mostly breakfast) recipes at home! With more than 115 recipes and more than 150 COLOR photographs, there is bound to be something to make your mouth water. "When I heard Zoe had compiled the sweet and savory breakfasts from Huckleberry into a book, I leapt at the chance for a baking lesson with her (I am a good cook, and a s**t baker). "These recipes are gorgeous, and the techniques were not hard to pick up. I’ve even made scones on my own since then. Take that." The even better tidbit, is that the owners of Huckleberry also own a few other equally wonderful neighborhood restaurants! Ahhh... can we say date night? Or a night out with your friends?! 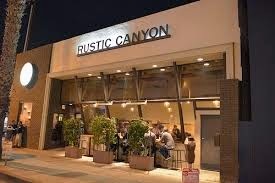 Rustic Canyon is fantastic. Amazing Farmer's Market inspired dishes and a killer wine list. Cocktail or artisanal beer more up your alley? Yep. They've got it and so much more. A beautiful restaurant in the heart of Santa Monica, just 11 blocks from the Pacific Ocean, put this on your list of restaurants! J and I have come here many times for date night and love it every time. Looking a sweet place to take your kiddos for homemade ice cream (or just yourself!) that is all natural - with no yucky additives or artificial ANYTHING? 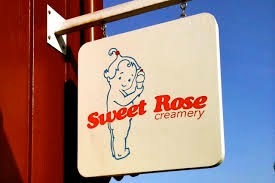 I love their original flavors, and great tasting ice cream. Can you believe these owners have yet another amazing place to dine? 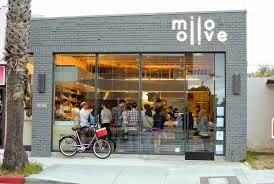 This little gem also has amazing food! We serve a bakery driven breakfast from 7 to 11am daily and a menu of wood-fired pizzas and Farmers’ Market inspired salads and small plates from 11am to 11pm daily. Breads and bakery items can also be purchased throughout the day. We look forward to feeding you soon. We love taking a walk and bringing the kids here for yummy wood fired pizza and a salad - so delicious! So - buy the cookbook - Huckleberry - and next time you are in Southern California, check out one (or all) of their great restaurants!